The gap in price between a 40-pound block of fresh cheddar and a 500-pound barrel has widened steadily over the last two years. At the end of 2018, the average block-barrel spread hovered around $0.12. That’s well above the $0.07 average spread calculated for 2017 and triple the traditional $0.035 spread. That’s caused a serious problem. The reasons why this is happening are complex. Adequately addressing the issue won’t be easy, speedy or popular. But the bottom line is clear: Market forces and a structural flaw in milk pricing have combined to depress pay prices to farmers. Cheese produced for mass consumption is sold as either a 40-pound block or a 500-pound barrel based on the cheese’s eventual end use. Typically, 40-pound cheddar blocks are converted into shreds, chunks or slices for the retail or food service industries. 500-pound barrels are destined for further processing into a wide variety of goods, like processed cheese slices, cheese sauces or cheese powders. Recent data show that processed cheese consumption slips about 4% annually. It’s largely due to consumers’increasing demand for fresh instead of processed cheeses and the popularity of health-conscious fast-casual dining options. And yet, barrel production has skyrocketed. Why? It’s all about byproducts. Whey, a natural byproduct of cheese production, has become immensely popular around the world. It’s shelf-stable, is easily shipped and can be concentrated into a protein-packed base for milk alternatives, protein shakes, energy bars and infant formula. The soaring demand for these products is met by soaring production of the cheese that yields it: Cheddar barrels. Some may wonder why barrels are preferred over blocks for whey production. Cheese is cheese, isn’t it? But block cheese is typically made with annatto—a red-orange food coloring derived from the seeds of tropical achiote trees. 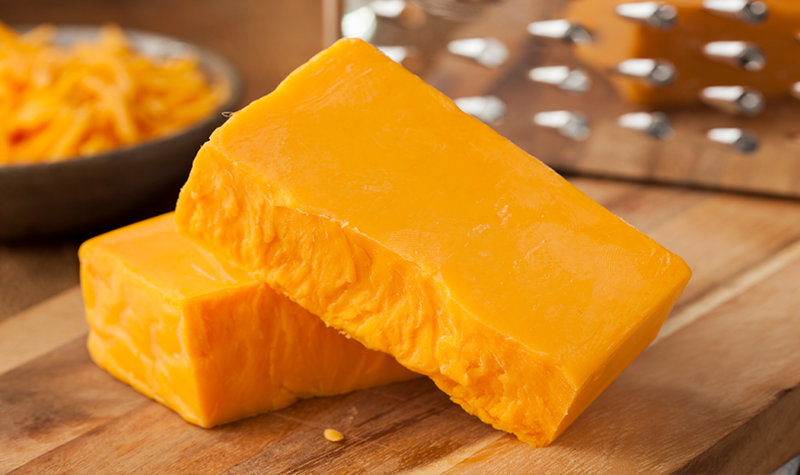 It’s what gives cheddar its classic hue. White whey is more appealing than red-orange whey among producers and consumers, and annatto typically is not used in barrel production. Processors have realized the real money is in white whey, and they’re willing to overproduce cheddar barrels to cash in. The other half of the block-barrel spread problem stems from the way milk destined for cheese production is priced. Around 80% of the milk produced in the U.S. is priced under Federal Milk Marketing Orders. The orders derive prices for milk based on its end use—in this case, milk destined for cheese is Class III milk. The price paid to farmers who sell milk for Class III utilization is based on a formula that accounts for the commodity prices of cheese, whey and, to a lesser extent, butter. Here’s the problem: The portion of the Class III milk price that’s based on commodity cheese prices relies on data collected by the USDA’s National Dairy Products Sales Report (NDPSR)—a nationwide survey of cheese plants. The NDPSR uses only cheddar block and cheddar barrel sales figures, even though cheddar cheese is no longer the most-produced cheese in the U.S. (it’s mozzarella). In addition, around 75% of the fresh cheese sold to consumers is priced based on block markets. Another 10% is priced uniquely, and the remainder is priced based on barrel prices. And yet, the NDPSR treats block and barrel prices equally. This means that the price of around 15% of the cheese sold in the U.S. has a 50% stake in determining the price of the milk that makes it. If the spread between blocks and barrels wasn’t so wide, this would be less of a problem. But the spread is wide and will only get wider. That’s because overproducing barrels to meet high whey demand also ends up depressing milk prices because of how the milk classification system works. In this zero-sum game, processors boost their margins and farmers earn less. It’s unfair, but it’s not against the rules. And it’s not like cheese processors are purposely shafting producers. This is just what happens when free market actors and regulatory frameworks clash. Turns out, free markets don’t behave like free markets unless they’re totally free. That’s not to say that industry stakeholders shouldn’t try to solve the problem. So how do they do it? We see two different ways forward. If the industry agrees its regulatory framework should price milk accurately, it’s intuitive that the survey responsible for developing part of that price should represent a better approximation of the reality of dairy markets. The NDPSR as it currently works falls short. Its reliance on cheddar blocks and cheddar barrels ignores the reality that mozzarella is the dominant cheese in the market. If mozzarella was added to the survey, and the survey was weighted so that mozzarella was the majority influence on the Class III milk price, the price would more accurately reflect the market. Such a change isn’t without its potential consequences. We know that mozzarella prices tend to be more volatile than cheddar. The product is also less shelf-stable. Adding it to the NDPSR would take some getting used to. The alternative is simpler: Remove cheddar barrels from the NDPSR to eliminate the source of inaccuracy in price formulation. With cheddar barrels out of the picture, cheddar blocks would become the only cheese product whose sales influence the Class III milk price. We know that cheddar is no longer the dominant cheese type made in the U.S., but it does remain the default product if demand for mozzarella or other American-style cheeses drops off. Because it’s still the default product, the cheddar block market would remain the most accurate and efficient reflection of supply and demand. Neither the addition of mozzarella nor the removal of cheddar barrels from the NDPSR is perfect. This sort of problem can never be perfectly solved—especially when operating under a free-but-not-really-free market like dairy. But it’s better than the current circumstances which unfairly harm dairy farmers. Any such change to pricing policy is a long way off. These kinds of things take years to settle. But there’s no time like the present to start the discussion. To learn more about the block-barrel spread and hear about ways it affects dairy markets, tune into this episode of The Milk Check, our monthly dairy podcast. Digging deep to keep you informed. Subscribe to The Milk Check podcast.